This poster was presented at the 28th Annual Southern Nursing Research Society-Enhancing Value-based Care: Generating New Knowledge, The Southern Nursing Research Society, San Antonio, TX, 2014. 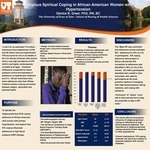 Greer, Danice B., "Religious Spiritual Coping in African American Women with Hypertension" (2015). Faculty Posters. Book 12.